I've got two cards today...I can tell my age is beginning to take it's toll. I had mounds of laundry and cleaning to do and was just too tired to post yesterday. Hope you'll forgive me. Here's the card I created for the SCS Clean and Simple Challenge (CAS116) this week. We were to use the Rule of Thirds. It's a rule of composition for photography or art. The link gives a grid and description. I used the Alpha Blocks die from Papertrey Ink to cut my little rectangles, popped them up on dimensionals, then added my sentiment. (PTI Train Tracks). Super easy, super simple. I have a problem lining things up due to a brain injury so I won't tell you how many times I had to move those little shapes! Next up is the Teapot Tuesday (MMTPT143) Challenge. This week's card destination is a fun one. We can choose to send the card to the person who uploads to the left of us, if they're participating in the challenge! I used the sketch from this week's Mojo Monday 188 Sketch Challenge. They've given us two options...round or square. I chose one of my most favorite shaped card templates from The Cutting Cafe - the Scalloped Circle! This month's inspiration challenge from TCC is shaped cards. 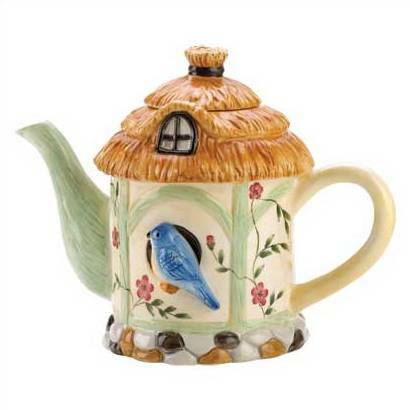 Here's the inspiration teapot although, if you choose to play, it's an anything goes challenge. I used one of my oldie but goody sets from Stamps by Judith called Early Bird. I also used the same DCWV adhesive backed paper that I used on this card. I think I'm addicted to it. No taping, no gluing...awesome colors! The sentiment panel is popped on dimensionals. I cut the backs off the brads and adhered them with glue dots. Shopping alert - There's a 20% off entire purchase coupon for Michael's link on the SCS link! Not sure how long it's going to be there so go pick it up....quick! The first one is 'simply' bright, cheerful, and pretty too! The second is lovely! I have that one down to simulate I hope! Fabulous cards! Love that CAS card and your little birdhouse card is adorable. Thanks for playing Mojo Monday! Great cards Charlene. I know what you mean about lining things up...I am very "particular" about that as I know you are as well. Love those bright colors on the first...nice CAS and the round card is a great version of the sketch challenge!